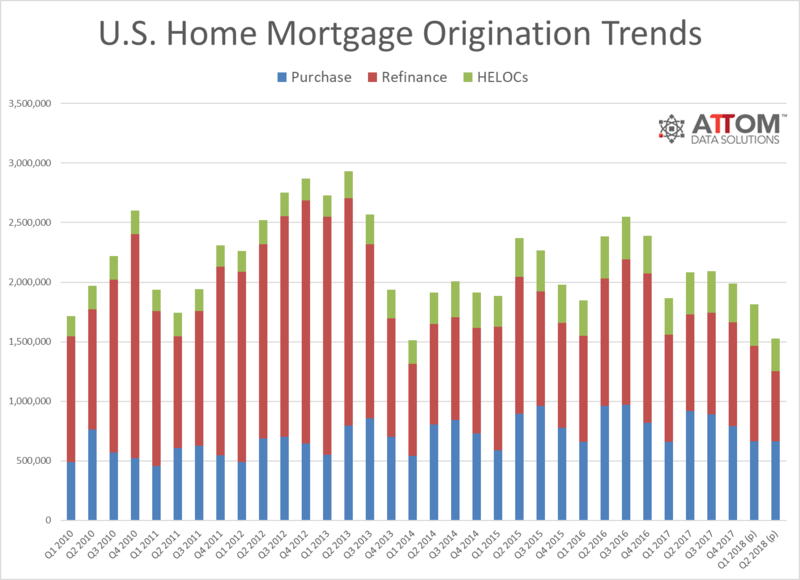 Weakening mortgage demand caused by rising mortgage rates has slowed loan originations to its lowest level since Q1 2014, according to Attom Data Solutions latest report. In Q2 2018, the number of loans secured by a residential property declined 16 percent quarter-over-quarter and 27 percent year-over-year to 1,527,433. Purchase loans took the biggest year-over-year hit, declining 28 percent to 662,713. Refinance loans dropped 26 percent from Q1 2018 and 27 percent from Q2 2017 to 591,868. Lastly, Home Equity Lines of Credit (HELOCs) dwindled 22 percent quarter-over-quarter and 23 percent year-over-year to 272,852. Only Hagerstown, Maryland (+51 percent); Beaumont-Port Arthur, Texas (16 percent); Raleigh, North Carolina (up 13 percent); and Ocala, Florida (+1 percent), experienced year-over-year loan origination increases among the 173 metropolitan statistical areas analyzed in the report. “Rising mortgage rates are cooling mortgage demand across the board, with overall originations down to their lowest level since 2014 — the last time we saw more than six consecutive months with average 30-year fixed mortgage rates above 4 percent,” said Attom Data Solutions Senior Vice President Daren Blomquist in a statement. Next articleAre Homebuyers Starting to Hit the ‘Pause’ Button?